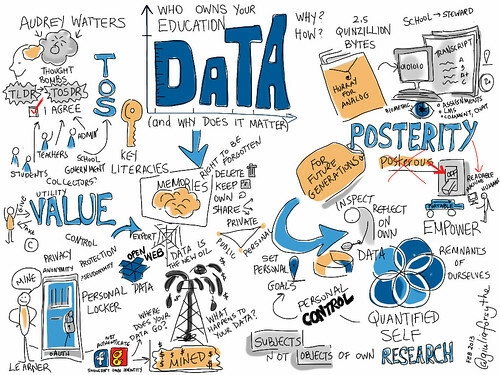 I'm not sure why the topic has resonated so deeply with me lately -- perhaps it's all the talk outside the ed-tech sector about the promises of big data; perhaps it's the metaphor of mining vis-a-vis data mining; perhaps it's this new obsession with becoming "data-driven" that I hear politicians posit for schools and students (and thus all the ed-tech products that follow suit); perhaps it's that I am both intrigued and concerned by the emerging field of learning analytics; perhaps it's because I continue to be frustrated by our lack of attention to terms of service and to control of our content (which is data); perhaps it's that I struggle with thinking through exactly how to navigate the personal and the public demands for sharing education data. Anyway, last night I facilitated a session as part of ETMOOC, a MOOC about education technology and media, organized by Alec Couros. Here's a link to the webinar recording and a link to my slides, along with the wonderful visual notes taken by the even-more-wonderful Giulia Forsythe.